Neurons in the brain communicate via electrical impulses and neurotransmitters. The nervous system is a complex collection of nerves and specialized cells known as neurons that transmit signals between different parts of the body. The nervous system is comprised of mainly two parts: the peripheral nervous system, which includes the nerves and ganglia on the outside of the brain and spinal cord, and then the central nervous system, which includes the brain, cranial nerves, and spinal cord. 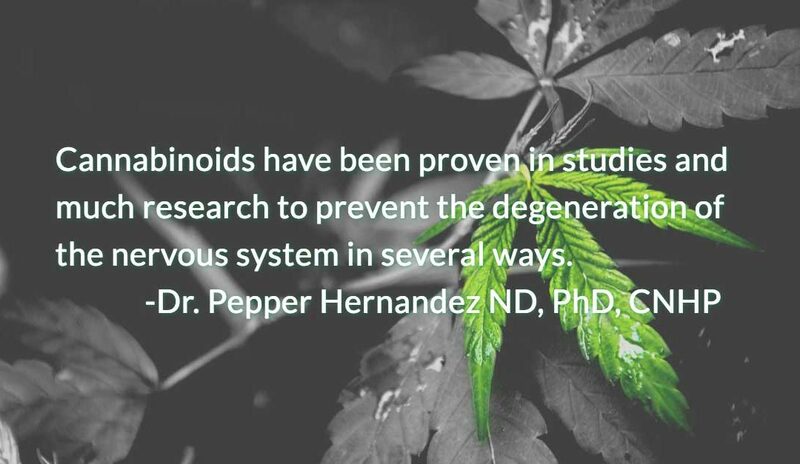 Cannabinoids have been proven in studies and much research to prevent the degeneration of the nervous system in several ways. The damage that leads to or causes central nervous system disorders can include trauma, massive amounts of stress, infections, degeneration, congenital problems, structural defects, tumors, blood flow disruption, and/or autoimmune disorders. Which there are many supplements, foods, and meditations that can help along with CBD to balance the nervous system. The central nervous system disorders are a broad category of conditions or diseases that affect the spinal cord or brain. There are many different types of central nervous system disorders, some of which include: seizure disorders (which I am very familiar with), cancer, inflammatory diseases, arthritis, schizophrenia (and other mental disorders), depression and/or neuropathy. While central nervous system disorders can vary greatly from each other, all the disorders cause a loss of sufficient, intact nervous system circuits that orchestrate particular functions in the body. Symptoms that are usually associated with central nervous system disorders vary depending on the specific condition, but can include everything and anything from headaches, stress, fatigue, tingling or loss of feeling, muscle weakness, loss of sight or double or blurred vision, memory loss, impaired mental ability, lack or coordination, tremors and or back pain. The human body has a fatty acid called amide hydroxylase (FAAH) which is an enzyme that breaks down the neurotransmitter, anandamide in cannabis, which is associated with the neural generation of motivation and pleasure. CBD suppresses the effect of FAAH in the body, creating higher levels of anandamide, which in turn naturally binds to Cannabinoid type 1 receptors (known as CB1), which are concentrated in our central nervous systems. The cannabis plant contains at least 85 types of cannabinoids, including CBD and THC. Which means that overall this helps calm the nervous system and help it find balance. CBD successfully stimulates the release of 2-AG, an endocannabinoid that stimulates both CB1 and Cannabinoid receptor type 2 (known as CB2). These receptors play a key role in regulating mood, memory, appetite, sleep, and reduction of inflammation within the human body. For this reason, topical treatments of CBD can help reduce brain inflammation associated with autoimmune disorders, and which may lead to damage of the neurons’ fatty covering. Reducing inflammation in the brain may also be used to treat neuropathic pain, which is caused by damage to the somatosensory nervous system. Studies have shown that cannabis has neuroprotective effects and supports the health of the brain and spinal cord which of course then helps in the treatment of a variety of central nervous system disorders. The cannabinoids found in cannabis, including cannabidiol (CBD) and tetrahydrocannabinol (THC), have shown they effectively protect neurons and astrocytes from damage, modulate inflammatory reaction and assist in neurodegeneration. Cannabis-based CBD like THC is one of the major cannabinoids found in cannabis, though unlike THC it has no psychoactive properties. So it is perfect for those who have a life that involves pure focus, like mine. CBD binds to the cannabinoid type one receptor in the brain so CBD doesn’t create any of the known “altered” like effects associated with THC use. A dosage of 20-40 mg of Cannabis-based CBD has also been used to successfully treat my anxiety and nervous system disorders. Please check with your health care provider to see what may work for you. All information in this article is for educational purposes only. Please check with your educated primary health care physician, naturopath or cannabis therapy consultant before beginning any new diet or lifestyle change. Also, remember not all CBD is equal. Only purchase CBD from the actual cannabis plant and flower. Not powdered industrial hemp, unless you live in a non-legal state. Let’s get to repairing the nervous system. Here are some foods that can help as well. *Cocoa: Dark chocolate has almost 500 mg of magnesium per 3.5 ounces. Let’s make our own medicinal Cannabis oil using the simple, safe and healthy olive oil extraction method. Here is a quick and effective way to do a small batch at home. Place the lid on tightly. Put a washrag in a small saucepan and place the jar in the saucepan. Put two or three inches of water in the pan. Allow the water to be heated this way for about 3 hours. If the water level in the pot gets too low, add some water to keep the pot from drying out. Shake the jar a couple of times each hour. Be careful as the jar will be extremely hot. After 3 hours, turn off the flame and cover the pot with a towel. Allow the jar to cool for another 3 hours. Now let the jar sit in the pot, covered with the towel overnight. Repeat this process for the next 3 days, if possible. You can use the oil after one day but the longer you repeat this process, the stronger your oil will be. Use this oil topically and take note of any changes you feel this oil has made to your body so that others might benefit from your experience.